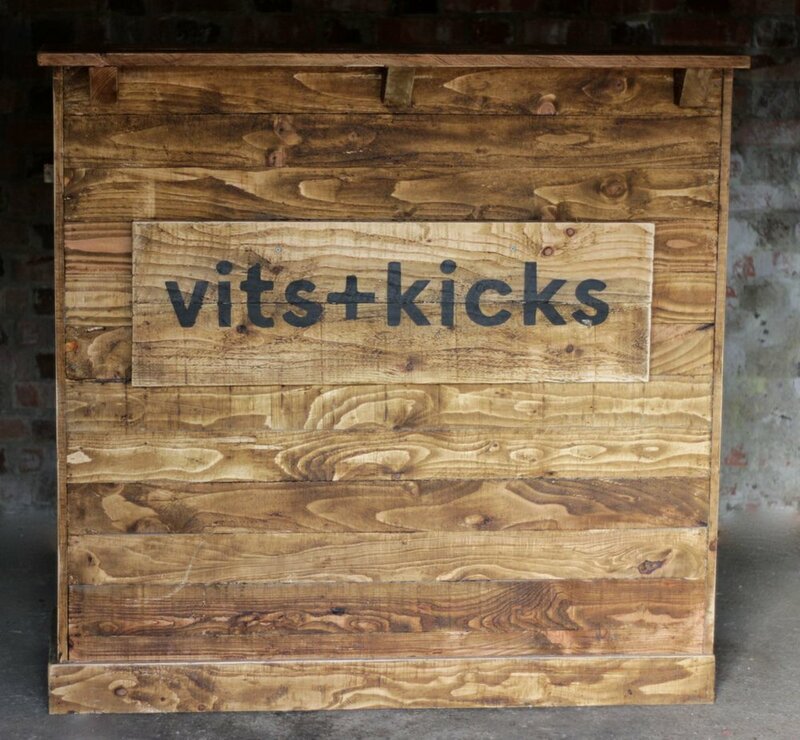 When Matt contacted us about his new Vits+Kicks business, we instantly knew that we could create a beautiful pop-up Quirky Space for his events, perfectly complimenting the cocktails he makes with fresh juices. As with all pop-up businesses, it was critical that flexibility was built into the design, as well as a combination of function and style. As such, we designed and created two bars which could work alone or fit together to create a longer serving space. With outstanding craftsmanship, the bars are built using reclaimed wood, stained for added impact. Both bars feature a customer-facing serving shelf to the front, above a functional countertop on which drinks can be mixed. Each unit has an inbuilt sink with drainage, for ice to be stored throughout service. With flexible shelving beneath, serving customers from these units is beautifully simple! A branding panel screwed onto the front of each bar completes the look, with the company name boldly but simply stated in an attractive bold black font. Quirky Spaces designs and creates bespoke event spaces, bars and exhibition stands. Commission your own Quirky bar or stand for events, shows or exhibitions to make sure that you attract a crowd. Click here to find out more.